Amiga Future 87 is also available in German language (both editions are otherwise identical). 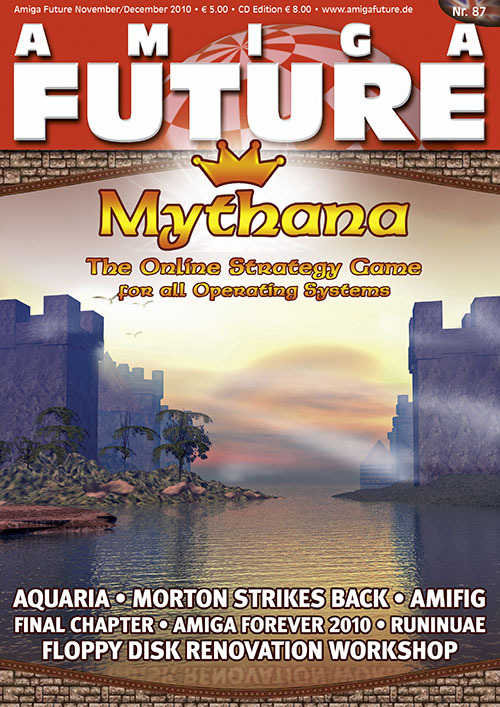 Amiga Forever 2010, Aquaria, Morton Strikes Back, Zero Gravity, Final Chapter, Mythana, AmiFIG, RunInUAE, TDTool. Commodore A2630, PSX Controller Adapter. Frotz part 1, Floppy Disk Renovation, Gimp in practice, C-Workshop part 4. Astro Photography with the Amiga, Amiga 4000, Carl Sassenrath on the Concept of the Amiga. Show-Report Classic Computing 2010, Interview LamTec, Editorial, Content-List, News, Up2Date, The herald of Tamar, Imprint, ReadersCD content, letters to the editor, Preview.